Study the anatomy of the ear from a different perspective. 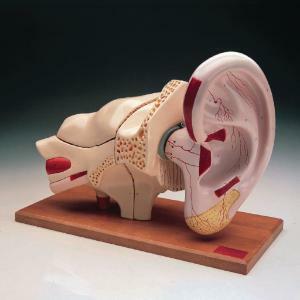 Unlike other models that show a temporal bone sectioned along the auditory canal, this model features removable sections of the temporal bone to clearly show the pathways of sound reception. In addition, the transparent, liquid-filled semicircular canals demonstrate the process of maintaining equilibrium. The skin is removed from the pinna to show the cartilage, nerves, vessels, and muscles and the pinna is removable for closer study. The petrous is sectioned horizontally and can be removed to reveal the middle and inner ear chambers; the mastoid can be detached to show the entire middle ear. The tympanum with malleus, incus, and stapes, as well as the two-part cochlea showing how the vestibular and cochlear nerves join to form the auditory nerve are all removable as well. The eight-part model is mounted on a base.